Thomas Blagge, was baptised in 1613 and married Mary North of Mildenhall, daughter of Sir Roger North. He was a groom to the bedchamber of Charles I and when civil war broke out in 1642 he raised a regiment for the king. It is difficult to believe that he raised the regiment in Suffolk, because this was deep inside Parliamentary territory. The valiant Colonel Blagge died within 6 months of the restoration on 14th November 1660 aged 47 and was buried in the north cross of Westminster Abbey. He left a widow who survived him by 10 years and four young daughters, Henrietta Maria, Dorothy, Mary and Margaret. Henrietta Maria married Sir Thomas Yarborough of Snaith in the County of York and Mary became the wife of Coldough. Margaret married the Earl of Godolphin, who became Lord High Treasurer of England. She died a few days after the birth of Francis, her only son. The daughter of the second Earl, Mary, married the Duke of Leeds and it was the 10th Duke who presented a plaque in her memory to the church at Breage in Cornwall. On the 12th August 1642, King Charles I made a proclamation asking all loyal men to assemble at Nottingham, where war would be declared. At six o’clock on the evening of 22 August, Charles reluctantly raised his standard, with a band of only 800 horse and 300 foot. The castle was in ruins and Charles made his headquarters at Thurland Hall, which belonged to the Earls of Clare. Here he was joined by his nephews, the two German princes Maurice and Rupert, and his two eldest sons, Charles and James. In this small way the Civil War began. The loyalty of Nottingham and Nottinghamshire was divided and recruiting was poor. Entertaining Charles and his senior officers proved to be expensive and his troops were damaging the pasture on Eastwood Common. The safety of the King could not be guaranteed, so eventually the gathering forces left for Shrewsbury, where some 6,000 infantrymen and 1,500 dragoons were assembling. On 12 October, the King marched on London, at the head of 13,000 men. The opposing armies would soon be joined in the first battle in a series of wars which was to divide the whole country. Charles met the Parliamentarian army of Sir Thomas Fairfax on 23 October at Edgehill, 7 miles NW of Banbury. The battle was indecisive and, although Fairfax withdrew from the field, Charles failed to take advantage of his success. So it was after a long campaign of almost 50 battles and sieges that Charles was eventually captured, tried and executed in 1649. The monarchy was overthrown and was not restored until 1660 under Charles II. Colonel Thomas Blagge of Horningsheath in Suffolk was one of the first to take up arms for the King, having served as Groom to the Bedchamber of His Majesty. 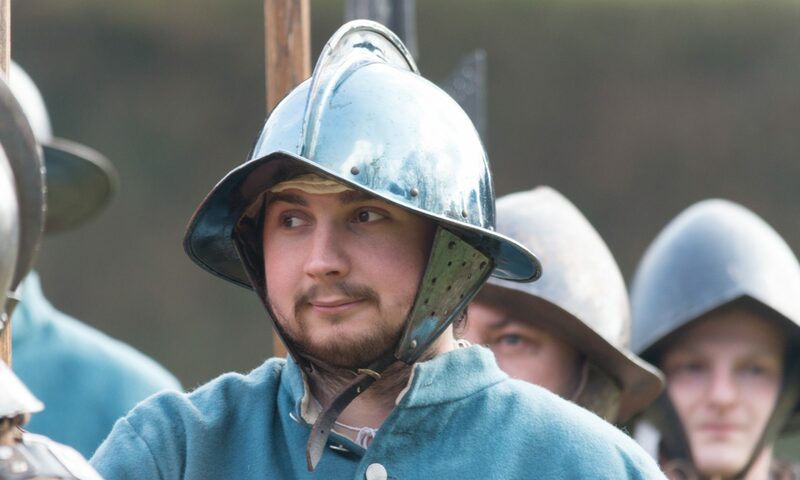 The tale below is the story of the siege of Wallingford, towards the end of the campaign, which was valiantly defended by a Royalist force under Thomas Blagge. Having failed to capitalise on his success at the battle of Edgehill (1642) and march on the rebellion in London, King Charles fixed his headquarters at Oxford. This was to remain his base throughout the war. In 1646, the city of Oxford was defended by a large force under the command of Prince Rupert, the King’s nephew. Charles entrusted the defence of nearby Wallingford to Colonel Thomas Blagge, an officer of great courage and military talents. Situated in a royalist stronghold, Wallingford had a strong castle and it appears that 1,000 foot and 200 dragoons were available for its defence. As the Parliamentarian forces approached Oxford, the King escaped, disguised as a footman. The city was surrounded and eventually surrendered, but Blagge at Wallingford was not disposed to yield. Abingdon and Reading had fallen and only Raglan and Pendennis were still held by the King. Charles fled northwards to Newark to join the Scots. The town of Wallingford was besieged by Parliamentarian forces, under the command of Sir Thomas Fairfax. There was much damage in the town, mostly from fires. Though there was no hope of relief, Blagge kept possession of the fortress, even though it was surrounded on all sides and there were daily assaults on the lines. Such was the resolution with which Blagge defended the position that Fairfax sought the aid of Cromwell and others. He had reported his progress from time to time to the Commons and discussed with them the terms for surrender. With their approval, a list of terms was drawn up and presented to Blagge, who refused to accept them until the King gave permission. Fairfax immediately ordered two more brigades to surround the town. 1. That the Castle and town of Wallingford, with all the ordnance, arms, ammunitions, stores, and provisions of war thereunto belonging, shall be delivered up without wilful spoil or embezzlement unto his Excellency Sir Thomas Fairfax, or such as he shall appoint to receive the same, upon Wednesday, the 29th day of July, 1646, by nine of the clock in the morning, in such manner and with such exceptions as are contained in the ensuing articles. 2. All officers and soldiers of the garrison, with all persons therein (that will) shall march out of Wallingford with their horses and arms properly belonging to them, with flying colours, trumpets sounding, drums beating, matches lighted at both ends, bullet in their mouths, and every soldier 12 charges of powder, match, and bullet proportionate, with one piece of ordnance with equipage, and with bag and baggage, to any place within 10 miles of Wallingford which the governor shall choose; where (in regard his Majesty hath no garrison left open nor army near) all their horses and arms, except what are allowed in the ensuing articles, shall be delivered up to such as his Excellency Sir Thomas Fairfax shall appoint; all the soldiers shall be disbanded and all such both officers, soldiers, and others shall engage themselves by promise never to bear arms against the Parliament, nor to do anything wilfully to prejudice their affairs during their abode in the Parliament’s quarters. Comment: Musketeers were armed with the matchlock, which was a cumbersome, inaccurate weapon that fired a heavy bullet for a distance of 400 yards. There was no hope of accuracy over 100 yards. They usually marched with 12 cartridges, but the rate of loading was so slow that even fighting 6 deep, the leading rank only just had time to reload before coming to the fore again. The burning match was a 2 foot piece of impregnated cord for igniting the charge. 3. That all such as shall desire to go to their houses or private friends (who shall not be prejudiced for receiving them) shall have the general’s pass and protection for their peaceable repair to and abode at the several places they shall so desire to go unto; the governor, officers, and gentlemen to pass with equipage of horses and arms answerable to their present and past commands or qualities; and all, both officers, soldiers and others, to pass with bag and baggage, and the troopers only with their swords and their bag and baggage. 4. That all such (if there be any) who shall desire to take entertainment for foreign service, shall have passes from their officers (not exceeding four), with their horses and two servants apiece to go to London, to treat with any foreign ambassador or agent for entertainment, and all of them shall have liberty and passes to march (the officers with equipage of horses and arms properly their own and answerable to their present and past commands, the common soldiers with their swords, and all with bag and baggage) to the quarters near unto Harwich or Southampton, or to any port between them, to be transported, where they shall be assisted in the procuring of vessels and shipping for their transportation at the usual rates accustomed for freight by the governor of the next garrison or port town, who shall also take care for their safety and accommodation with quarters until the shipping be provided and weather seasonable, they paying for the same after twenty-eight days from the render. 5. That all the persons now in Wallingford (not being of the soldiery of the garrison) shall have liberty and protections for their persons and goods to stay in the town of Wallingford one month after the rendering (if they desire it), and then to have the general’s pass and protection, as others going out at the rendering upon the like engagement; and that any person whatsoever (who being sick or wounded cannot at present remove) shall have liberty to stay till they be recovered, or able to go away, and shall have fit accommodation and subsistence provided for them during such their stay, and then shall enjoy the benefit of these articles. 6. That no person whatsoever comprised in this capitulation shall be reproached, reviled, affronted, plundered, or injured in their march, rendezvous, or quarters, journeys, or places of abode, by these articles allowed, nor shall be compelled to bear arms, nor be imprisoned, restrained, sued, molested, or damnified, for any matter whatsoever of public or private concernment relating to the present war, the matter or grounds thereof arising before the rendering of the garrison, during the space of six months after the rendering thereof, nor be compelled to take any oaths or other engagements than what is mentioned in the second article, during the time of six months, and to have liberty during the said time to travel about their lawful affairs. 7. That all horses and other goods now in Wallingford, taken as lawful prize of war, or properly belonging to the governor or officers of the garrison before or during the siege, shall be continued in the possession of the present possessors, except such as are to be delivered up by the tenor of these articles. 8. That such household stuff and goods now in Wallingford as shall appear to the general, or such as he shall depute for that purpose, to have been borrowed by any officer or gentleman in the garrison for their use and accommodation in the garrison, shall be restored back to the owners. 9. That if any person or persons shall wilfully violate these articles in any part, the guilt thereof shall be imputed to such person or persons only, and shall not prejudice any other not acting or consenting to the same. 10. That the governor and three more such officers and gentlemen as he shall name shall have passes from the general for themselves with two servants apiece, their horses, swords, pistols, and necessaries, to go to the king to give him an account of the said garrison, and to return to their homes or friends; and that five weeks shall be allowed for this journey, which shall not be reckoned any part of the six months mentioned in the sixth article; but he and they shall be allowed six months after the end of the said five weeks. 11. That no officer, soldier, or other person, who, by the articles, are to march out of the Castle or town of Wallingford (or shall march in), shall plunder, spoil, or injure any inhabitant or other person therein, in their persons, goods, or estates, or carry away anything that is properly belonging to any of them. 12. That all persons comprised within these articles shall peaceably and quietly enjoy all their goods, debts, and movables, and to depart the kingdom with the same as they shall think fit and desire, and shall have passes for their transportation accordingly, from his Excellency. 13. That all persons comprised in these articles shall, upon request, have a certificate, under the hand of the general, or such as he shall appoint, that such persons were in the Castle and town of Wallingford at the time of the rendering thereof, and are to have the benefit of these articles. 14. That the townsmen and inhabitants of the town of Wallingford shall not be troubled or questioned for anything said or written by any of them, nor the corporation thereof prejudiced for anything done by any of them by express command since it was a garrison, and that they shall have the benefit of these articles in all things that may concern them. Seven ordnance were taken, together with 800 arms and the colours. The Castle was turned into a state prison, before being demolished stone by stone on the personal order of Oliver Cromwell; all that now remains are the ruins of a tower facing the river, a small section of the hall overlooking the northern moat, the massive earthworks and a castle mound. The situation of the castle was once so strong that long after its destruction, the Marshall-Duke of Schomberg pronounced it capable from its natural resources of being rendered almost impregnable. Colonel Thomas Blagge’s Regiment of Foote was raised in 1642, but only a few other details are known. Blagge was a Suffolk man, as were five out of 12 indigent officers, but it seems strange that a Royalist regiment was raised in the heart of the Eastern Association. Maybe his influence, coupled with that of the families of Jermyn, Hervey, North and Gilbert, with whom he was connected, gave him a great deal of power. The King personally signed for the monies paid to his soldiers and there are the following entries from 1 April 1642 to 26 Oct. 1643. Blagge’s Lieutentant-colonel was Sir William Lower, who was probably with him from the first and Barnaby Scudamore was his Major. Henry Hastings raised the regiment. Robert Walters of Little Ouseburn, Yorkshire, was serving under Blagge in 1643, so he may have been one of the original captains who fought with Blagge (690) at Edgehill in 1642, along with Sir John Belasyse’s Regiment of Foote (505) and Sir William Pennyman (685). All three regiments were under the command of Sir John Belasyse. Blagge also fought at Marlborough before taking over as Governor of Wallingford Castle. When the King’s army was engaged in Cornwall, the infantry was divided into three tertias, each tertia consisting of three brigades. The first tertia was commanded by Colonel Blagge, although it is thought without his own men. Whilst garrisoned at Wallingford, Thomas Blagge’s Horse were drawn out to relieve Greenland House, which was besieged by Parliamentarian forces. They succeeded in carrying to safety some 29 women and some plunder. Sometime later, the forces of the Parliament, having been joined by Major General Brown and his whole brigade, were more successful. Greenland House and Fort, of which Colonel Hawkins was governor, were surrendered to them upon certain articles, which secured an easy retreat for the defending party, with their colours, horses, swords, pikes, and muskets. Article 4 stated that the general shall cause to be provided for the officers and soldiers two teams and carts, to carry away their baggage and necessary provisions for their journey to Wallingford, which carts and horses are to be returned so soon as they come thither. After the death of Charles I in 1649, Colonel Blagge joined the young prince Charles. An ardent royalist, Blagge later fought at Worcester in 1651 with Charles II in an attempt to regain the throne and kingdom. After the defeat, he fled with Charles and about 60 others, including the Duke of Buckingham, the Earls of Derby and Lauderdale, Lords Talbot and Wilmot, Col. Roscarrock, Marmaduke Darcy, Richard Lane, William Armorer, Hugh May and Charles Gifford to John Penderel’s house called White Ladies, where they separated. Apparently, as part of their plan of disguise, they decided to speak French as they neared Stourbridge, a decision which looks a little bewildering in retrospect. White Ladies was originally a priory and the party were not happy about the security there, so Francis Yates, husband to Elizabeth Penderel took Charles to Boscobel, about half a mile away. This was well known for being a refuge for catholic priests, with many secret hiding places. Even so, Charles decided to hide in a nearby oak tree rather than endanger the family. The parliamentarians had pursued the fleeing party and Francis Yates was soon captured. After being tortured and questioned he was eventually executed, but as a reward for their loyal service to the king, the Penderel family were awarded a pension for life from the king’s own purse. Charles had to change out of his royal regalia and adopt a disguise, so he cut his hair very short, dirtied his hands and face and put on country clothes. The only problem was his shoes, which did not fit well. He entrusted his watch to Lord Wilmot and his diamond badge as Knight of the Order of the Garter to Colonel Blagge. With Richard Penderel, he set out to reach London, and after many adventures eventually managed to take a ship at Shoreham for Fecamp and escape. Wisely as it turned out, Charles had refused to follow the plan drawn up by the Nobles and Gentlemen at White Ladies, in which he was to join 3,000 of General Lesley’s Scottish Horse who had escaped from Worcester. They were all routed by a single troop of horse within six miles at Newport. The Earls of Derby and Lauderdale and Gifford were taken prisoner, but the Duke of Buckingham, Colonel Blagge, Darcy and May found refuge at Bloore Park about five miles away. Buckingham escaped to join Charles in France, but Blagge remained at Mr. Barlow’s house and hid the badge for safety in a heap of chips and dust. He was eventually captured, taken prisoner and held in the Tower of London. Whilst there, a friend named Mr. Robert Milward retrieved the badge and passed it to Mr Isaac Walton who brought it to Blagge in the Tower. Not long afterwards, he managed to escape and restored the badge to Charles. The badge was regarded as sacred in the eyes of every knight and great honour was concerned in its safe keeping. It was the badge of the most noble order of knighthood in Europe and this badge was the one worn by Charles I at his execution. The badge was cut in an onxy set about with twenty-one large table diamonds in the fashion of a garter. On the reverse was a picture of the Queen set in a case of gold, the lid neatly enamel’d with Goldsmith’s work and surrounded with another garter of diamonds like those at the front. Colonel Blagge also fought at Dunkirk-Dunes June 14, 1658. It was a military victory where the French and Cromwell’s English forces led by Henri de La Tour d’Auvergne, Viscount de Turenne, attacked Spanish forces near Dunkirk (then in the Spanish Netherlands). The Spaniards were heavily defeated and 4,000 prisoners were taken. Charles II and the future James II fought on the Spanish side. The victory contributed greatly to the surrender of Dunkirk by Spain and to the conclusion of the Peace of the Pyrenees by France and Spain (1659). Oliver Cromwell died in 1658 and his son proved to be weak in comparison, soon falling victim to internal jealousy. A national tax strike helped bring about the disintegration of the army and free elections were held. The Royalists eventually sent a ship to Holland to fetch the king and return him unconditionally to the throne. He landed at Dover on 25th May 1660. One of Blagge’s four daughters, Margaret, was born in 1652. Details of her life and times and of her marriage to Sydney Godolphin can be found in the Diary section of this page. Both Margaret Blagge and Henrietta Maria Blagge, her sister, were Maids of Honour to the Duchess of York and, after her death in 1671, Margaret became Maid of Honour to Queen Catherine. “The Life of Mrs. Godolphin” by John Evelyn of Wootton.